One of the most important things to remember when designing a comprehensive training program: It must be connected to business goals, and these goals must establish a quantifiable benefit to the business. Making the connection "up the line of sight," from training costs, to skills and competencies, to work processes, and ultimately to organizational goals (and thus, financial benefit) is the ultimate goal. The diagram below provides an example. Let's say your company has established new market goals that will result in five million dollars revenue. Furthermore, let's say that your department or business unit is going to be responsible for several components, roughly valued at one-fifth (20%) of these new goals. Now, a few key performance indicators (KPI) have been established, and there's a big one: Get to market in less than six months. If you can do that, it's going to give you a big advantage over your competition. That KPI alone is worth a good 30% of the total picture, and another KPI (let's say some unique feature) is worth another 20%. Combined, these KPI's represent 50% of the overall revenue goal -- if you don't get to market in six months, or you don't have this feature, you fall to second place and your huge lead is gone. In order to do it, you'll need to work faster and deliver a number of key tasks. 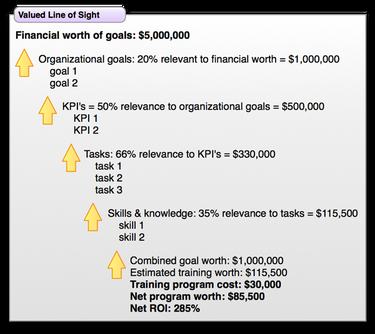 Without these tasks, only about a third of the market goals can be met -- thus, the tasks have a 66% relevance to the KPI's. Finally, the training program that's going to make all this possible is a big one: Without it, about a third of the planned tasks won't be possible, or won't get done on time. Hence, the training program is 35% relevant to the project tasks. The bottom line: If you start at $5,000,000 and do the math "down the line of site," you'll find that the training program is worth about $85,500. Now it's just math -- if the program costs less than it's value, it's a good deal: In this example, the training costs $30,000, so that gives an ROI of 285%. Even though training may seem like a luxury expense -- especially in tight financial times -- it is in fact the most sure, reliable investment an organization can make. It all comes down to tangibles, and as Andrew Walker pointed out to CIO News, it's not difficult to achieve: "Is the help desk giving better help than before its staff was trained?" Walker said. "Most IT organizations are doing customer surveys anyway. Include a question that looks at whether learning opportunities are impacting customers. It isn't too difficult. Then look to continually improve on that because then you've got a process in place. It's not so hard to do. It just never seems to hit the top 10 of CIOs' important concerns at any time." (CIO News, May 2007). Organizations that are "training challenged" must learn to do things differently. This includes delegating authority along with responsibility, being inspirational to employees, building trust and improving communication -- all of which are direct benefits of a comprehensive process that incorporates training. When senior leadership embraces "process", then all elements of the process, including training, will be regarded as an investment with specific goals and measurable, tangible outcomes. Training becomes strategic and the process demonstrates how to measure its success. Click here for Part 1 of Should Training be an Integral Part of a Project Budget to Increase Project Profitability?